Try it and You May! : Will my kid starve in Germany? Will my kid starve in Germany? We have a picky eater. You've read about him before. I worried about how my middle son would fare in Germany. Appearance and smell powerfully impact his decision-making when it comes to food (like most kids). He has a somewhat low threshold. 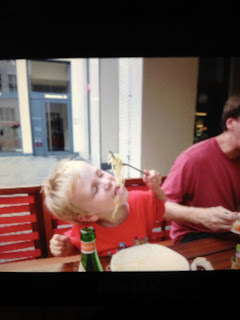 The start of the trip was stressful when he gagged on a kartoffel (fried potato) at the Viktualienmarkt in Munich. Paprika-flavored Pringles - not my favorite, but we celebrated his trying something new regardless! Peanut Butter Clif Bars - yes, he was really hungry when he tried it the first time but asked for it several times over the course of a few days. Orange Juice with pulp - this took 2 weeks but at the grocery store here in Pittsburgh he actually requested it! I should've had a bit more optimism. Being in a new place can encourage all kids to try many new choices. After all, it was in Ireland that my middle son discovered he loved scrambled eggs with Irish butter. He loves them so much he cooks them at least once a week (with adult supervision but basically no adult assistance). 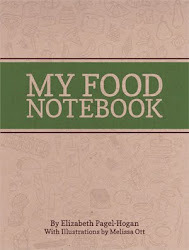 He did stick by some reliable food choices, like green apples, strawberries, pasta without sauce and bread with nutella. But adding three new food choices to the list isn't bad for a two-week vacation in a foreign country!